Punjab Police has introduced Online Complaint Service through SMS, Call or Email. Any citizen could contact police helpline 8787 to get a compliant registered in connection with denial and fake registration of an FIR, wrong investigation, illegal demand from an official, illegal arrest of a citizen and illegal confinement. DSP concerned would contact the complainant, resolve the issue and immediately report to the Punjab Police Complaint Centre. If Punjab police is not registering your genuine FIR. If Inquiry Officer is not carrying out the investigation correctly and lawfully. If Punjab police has arrested someone unlawfully. If an innocent has been arrested in a case without any reason or someone has registered false FIR against you. If any Punjab police officer is demanding bribe from you. If Police is using delaying tactics in a genuine complaint. How to Register Complaint to Punjab Police? You may call and send SMS at IG Punjab police complaint cell helpline number i.e 8787. Procedure about sending SMS has been given in the image given below. You may also file your complaint at official website of the force i.e www.punjabpolice.gov.pk. Remember that 8787 is not an emergency number. This number is just for routine complaints. For any emergency complaint you should contact on just 15 for immediate response. We request you not to misuse this useful facility just for enjoyment or teasing other. Remember that you will have to provide your name, and CNIC number at the time of registering your complaint, otherwise no action will be taken on your complaint. 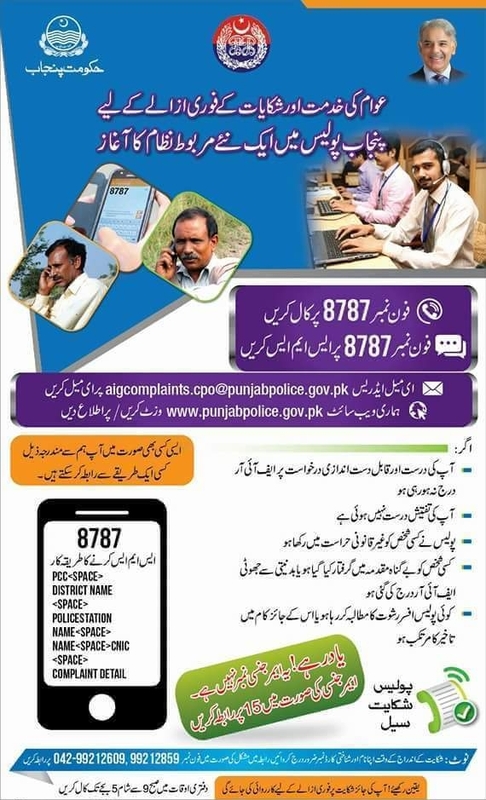 In case of difficulty in dialing Punjab police complaint cell number 8787, kindly call at 042-99212609 or 042-99212859. You may call on 8787 from 9 AM to 5 PM. Punjab police assures you that action will be taken on all genuine complaints as per law.